ChildAge: 4-12 years. Under 4 ride free. The Old Town Trolley and Maritime Museum of San Diego Package combines an Old Town Trolley Tour and a popular San Diego attraction. 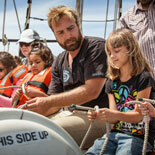 San Diego offers a wide array of things to see and do for visitors of all ages. Let Old Town Trolley show you the best views, sites and attractions San Diego has to offer, one of which is the world-renown Maritime Museum. The Museum consists of seven historical ships that people from all over the globe come to walk their decks, like The Star of India, the World's oldest sailing ship. More than 100 Points of Interest. Since this is an Old Town Trolley and Maritime Museum of San Diego Package, you will reap the rewards, benefits and fun of what all three have to offer, Old Town Trolley, Maritime Museum and beautiful San Diego. 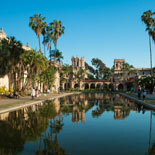 As you explore the scenic coastal landscape, you will learn why San Diego is called "Americas Finest" city. The gorgeous skyline views, miles and miles of beaches, numerous attractions and activities, blue skies and lots of sunshine. 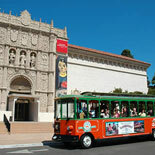 Old Town Trolley Tours has provided sightseeing tours highlighting the best of San Diego since 1989. By choosing an The Old Town Trolley and Maritime Museum of San Diego Package, you can see all the sites and hop off at all the places you want to visit. The friendly conductors are pleased to guide you through the birthplace of California. They narrate the tour with a fascinating and fun mix of trivia and humorous stories. It is a delightful combination of transportation and entertainment, "Transportainment". 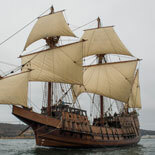 Visit the world's oldest active sailing ship at the San Diego Maritime Museum. The 1863 Tall Ship - Star of India has sailed around the world 21 times, has been trapped in Alaskan ice, and was made 'American' by an Act of Congress. You definitely do not want to miss one of the most popular San Diego Attractions located close to the Embarcadero Marina. The Maritime Museum of San Diego features a world-class collection of historic vessels including sailing ships, steam-powered boats, submarines, Vietnam Era Swift-boats and one of the oldest Pilot Boats still in operation. They represent a unique set of international, national and state narratives. You will be invited to step aboard each of the historic ships, where you will explore and discover their rich, living history. 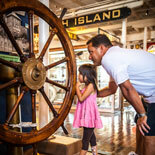 The mission of the Maritime Museum of San Diego is to serve as the community memory of one's seafaring experience by collecting, preserving, and presenting rich maritime heritage and historic connections with the world. Let Old Town Trolley handle the logistics of your vacation, so you can relax, enjoy, take pictures of the breathtaking sites and and make memories to enjoy for years to come. Old Town Trolley: Tours depart daily at 9 am approximately every 30 minutes from Old Town Trolley Depot and from various locations around the city. Departure times vary for locations. Check individual location schedules. Closed Thanksgiving and Christmas Day. Maritime Museum: Open most every day of the year (some ships can be closed for special events) 9:00 am - 8:00 pm including all holidays. Summer hours starting Memorial Day open until 9:00 pm till Festival of Sail which falls on Labor Day Weekend. 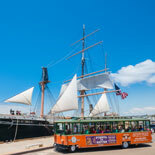 Old Town Trolley: Twiggs Street and San Diego Ave. Maritime Museum: Ash St and N. Harbor Dr.
Free parking is available at Old Town State Park for Old Town Trolley Tours. Parking: Maritime Museum, Port of San Diego metered spaces. They are enforced 10:00 am - 8:00 pm Mon, Sun. Good for up to 3 hours. Several day lots (pay to park) within a few blocks of the museum. Midway lot open to public. Free parking is available at Old Town State Park. Take the Trolley and park in one of several lots in various locations. Old Town Trolley begins every day (except Thanksgiving and Christmas) at 9:00 am at the Old Town Trolley Depot and departs approx. every 30 minutes; however, you can begin your tour at any of our stops. Please note: Each stop has a different starting time. Call Customer Service number 619 298-8687 for specific times. Accessible Accommodations: We require a 24-hour advance notice by calling 619-298-8687. Maritime Museum schedule is subject to change. Events may be postponed or canceled due to adverse weather conditions, mechanical problems, safety concerns or for any reason determined by Maritime Museum of San Diego and Old Town Trolley staff. Patrons with eTickets (voucher) can board at any Old Town Trolley boarding location. Without an e-Ticket voucher or mobile ticket, you must go to the ticket booth location with invoice order number.